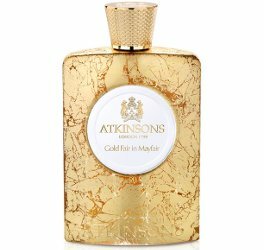 British brand Atkinsons has launched Gold Fair in Mayfair, a new limited edition fragrance. Inspired by the striking wall art painted onto the label's prestigious Burlington Arcade store in London, Atkinsons teams up with designer Christopher Jenner to give the bottle of its latest scent - Gold Fair in Mayfair - a glass-etched effect. Opening with smouldering top notes of absinthe and nutmeg, the fragrance unfurls into a warm floral bouquet of iris that is deepened with lush ambrox and vetiver. Each box has been handcrafted in Florence and each bottle is uniquely numbered, making it a covetable addition to your perfume collection. Additional notes include cocoa beans, sage and styrax. Atkinsons Gold Fair in Mayfair is available now at Harrods in the UK, in 100 ml Eau de Parfum, £180. Thank you for the info re the standalone shop in the Burlington Arcade, Robin – I wasn’t aware – the BA is one of my friend’s favourite places to stroll through, so we no doubt will when we’re there next month – once again, with our handcarry only luggage situation, I may just have to try to blag a few samples; or take the spur of the moment trip to Glasgow I mentioned on here a little while ago, as Frasers stocks this brand, but may not do so for much longer given the new owner…! Malle is there too, plus Chanel, Kilian, Roja Dove, Penhaligons — so not a bad idea, although you can probably find all of it at Harrods anyway. Believe me, Robin, BA’s Penhaligon’s has been well patronised by Marion & me over the years! It has been a couple of years since we popped in, though, so Atkinson’s & Kilian, & of course Penhaligon’s, are on my ‘to do’ list for November. You’re right re everything being available at Harrods, but the shop itself can be a real slog! BA is always lovely to wander through, & beautifully decorated for Christmas – plus you can’t beat their Beadles…! Thank you. I was just remembering a BBC documentary from a few years ago about women in employment through the ages, & the BA featured in a segment hosted by the lovely Trevor Pickett from Pickett Fine Leather which used to be in the arcade but moved to a nearby location a couple of years ago due to ‘big business’ moving in & independents no longer being able to afford the rents (which I’m not a fan of but I am a Pickett fan & have one of their gorgeous ‘day bags’) where he was describing the businesses that used to be there & in the surrounding Piccadilly area & apparently in a certain era the rooms above the ground floor shops were used by ladies of ill repute to entertain their clients! It was a fascinating documentary overall but the BA bit was an eye opener for sure.